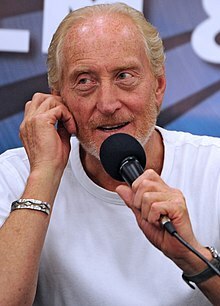 Walter Charles Dance, OBE (born 10 October 1946) is an English actor, screenwriter, and movie director. Dance is known for his roles as Tywin Lannister in HBO's Game of Thrones, Guy Perron in The Jewel in the Crown (1984), Sardo Numspa in The Golden Child (1986), Jonathan Clemens in Alien 3 (1992), Benedict in Last Action Hero (1993), the Master Vampire in Dracula Untold (2014), Lord Havelock Vetinari in Terry Pratchett's Going Postal (2010) and Alastair Denniston in The Imitation Game (2014). Dance was appointed an Officer of the Order of the British Empire (OBE) on 17 June 2006. He lives in Kentish Town in north London. ↑ "Charles Dance - Biography". Yahoo! Movies. Archived from the original on 15 October 2012. Retrieved 12 November 2012. ↑ "Charles Dance Biography (1946–)". Filmreference.com. Retrieved 2012-11-12.